The 1960s was a strange decade for animal lovers. People were becoming more concerned with the welfare of strays and treating their pets more like children. 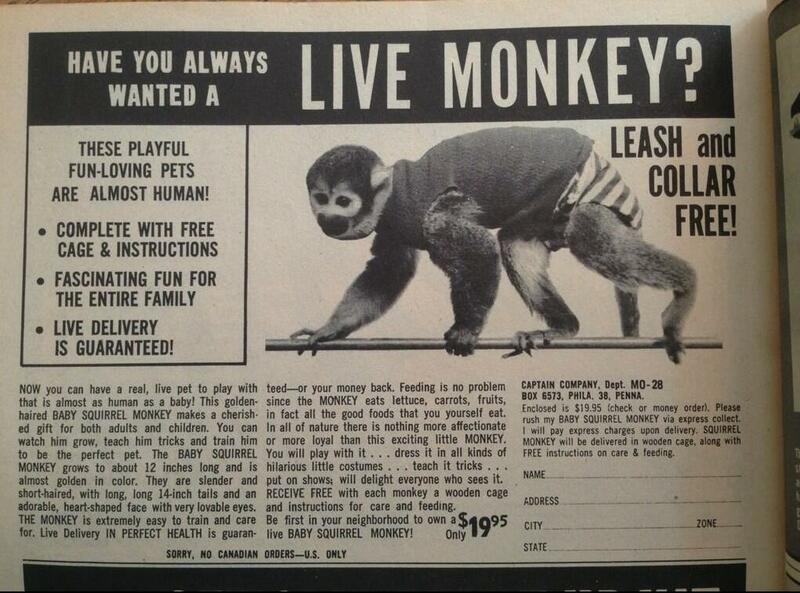 You could also mail-order a live monkey. 1. People buttered their cats' paws. A leaflet on cat care from the '60s suggests putting butter on your new cat's paws to help him settle into his new home. The leaflet suggests restricting the cat to one room and to "... butter his paws liberally." I'm not sure if this actually worked, but I can confirm that my cats enjoy licking butter off toast. 2. Dog clothes became a thing. Doggy coats in red and black buffalo plaid were popular. Fancy little dogs could be found wearing fancy little fur coats, and maybe even matching boots and a hat according to The Pet Historian blog. Nail polish and rhinestone encrusted collars were also in vogue. 3. Stores began selling dog food. Advertising played a big part in switching dog's diets to packaged dog food. Reports influenced by pet food industry lobbyists appeared in magazines and radio spots. These "reports" explained the benefits of packaged dog food and the dangers of feeding dogs table scraps according to Neatorama. 4. Pets got people names. Conducting a study of America's first pet cemetery, Anthropologist Stanley Brandes researched the evolution of pet names. As stated in this Mental Floss article, human names started to appear on pet's gravestones. "... names like Riko, Ginny, Francois, Samantha, Daniel and Venus started to pop up among names like Freckles, Snowy, Clover, Spaghetti, Champ, Happy, Rusty and Taka." Even non-people pet names were gender specific, like Mr. Cat. 5. The Animal Welfare Act of 1966 was passed. This groundbreaking law passed in 1966 protecting pets used for research and in exhibitions. The Animal Welfare Act also required anyone selling pets to be licensed and registered. These places were monitored by the Feds. Violations were punished by up to a year in prison and a fine of $1000, along with the loss of their license. 6. Americans were crazy for poodles! According to the American Kennel Club, German shepherds came in as the number two dog of the decade. Beagles made it to number three on the list, followed by dachshunds, chihuahuas, pekingese, collies, mini schnauzers, cocker spaniels, and lastly, basset hounds. 7. People made gravy for their pets, like all. the. time. Before you could buy fancy salmon-and-quinoa flavored dog foods in the 21st century, General Foods offered households in the 1960s pet foods that came with their own gravy. Pups eagerly chowed down on heaping bowls of Gravy Train covered in tap water. 8. The presidential pup of choice was the beagle. From 1963 - 1969, beagles ruled the white house. According to The Presidential Pet Museum, President Lyndon B. Johnson had four beagles: Him, Her, Edgar, and Freckles. The beagles had full range of the White House, swimming in the White House poor or attending meeting in the Oval Office. Also noteworthy — LBJ picked up his beagles by the ears, much to the horror of the ASPCA and hundreds of upset dog lovers. He did, however, issue a public apology. 9. You could mail order a monkey. No kidding. You could order a monkey for less than $20.00. The monkey was guaranteed to arrive to your doorstep alive (yay! ), complete with a cage and instructions. These mail-order monkey ads were found in Boys Life magazine and comic books. Find harrowing stories of monkey deliveries on Boing Boing and NPR.